is what this card is!! I made this for a wedding couple a while back and just LOVE how it turned out. However, I think I would have trouble mailing it in a regular envelope with that large button! Anyway, here are the details....pretty simple really. 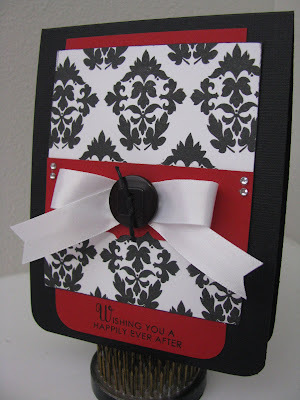 I started with a stamped True Black Damask Designs panel layered onto Pure Poppy cardstock with a small Pure Poppy layer on top. This was embellished with a large white satin ribbon bow tied with a large black button with black twine. 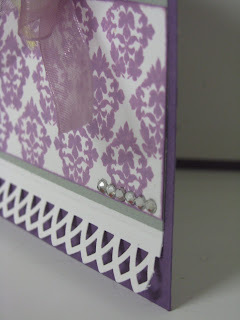 A few rhinestones to flank its sides and a Upper Crest punched border underneath (this part is hard to see). This is the first time I'd inked up a part of the Wishing You set too! Hello all, hope you are feeling well as I think the flu bug has hit our house....however, thank goodness after birthdays. Here is a cheery card made with On My Couch/Additions again!! Are you all tired of this set yet? 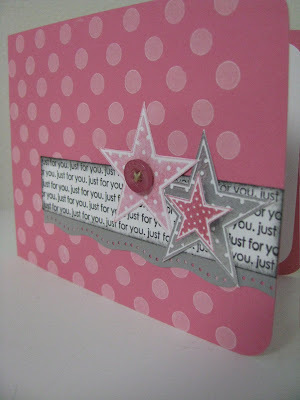 The sentiment was simply curved on my block and stamped....love that you can do this! 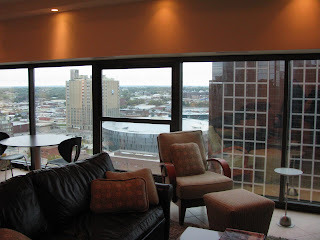 How about that chair "upholstered" in Damask Designs? So sophisticated. Right above the punched border, I've scored some lines above it. Again, just that little detail. Here are a couple of other views of this card. Sorry this is short but gotta get some rest to care for the sickies! Please leave me a comment if you like this!! I have been meaning to post this card and well, just haven't gotten around to it. 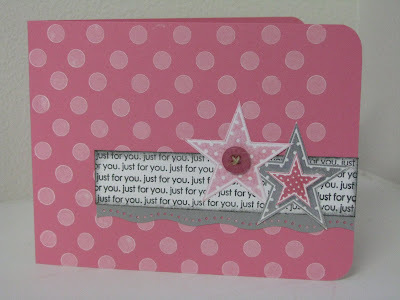 This is a favorite of mine using Star Prints and Polka Dot Basics. I actually cut these stars out by hand before I bought my star punch by Fiskars. Having this punch makes this set SO easy to use. I love how you can layer the stars and the addition of the stitched button! 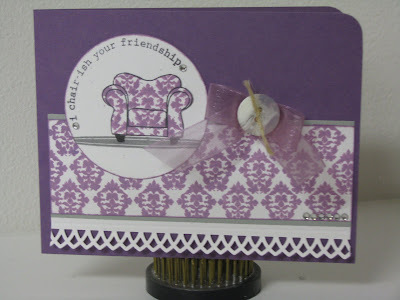 Ok, here is another card using On my Couch stamp set from PTI. I really think this is one of my favorites!! Besides that, this color combo is just to die for!! My text background was stamped onto Kraft cardstock. The couches were stamped in Dark Chocolate ink and the middle couch was stamped onto Bitty Box paper and then cut out and raised with a dimensional! Oh, and don't you like that coordinating pillow? Hehe, it really is the little things that make me smile! I also busted out my Lemon Tart ribbon for this one too.....not alot just a little! 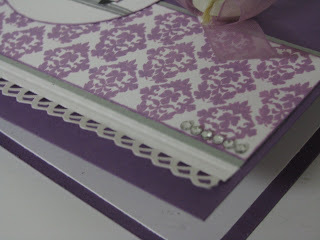 The border was made using the Apron Lace punch by Fiskars. Take a look at the bottom picture for the "little" details! What do you think about this one? I have some other ideas for this set and now just need to sit down and play some more!